For those looking for Italian food on their next Oasis of the Seas cruise, Giovanni's Table offers family-style Italian in the Central Park area of the ship. Today, we review this Mediterranean enclave. Interesting note about Giovanni's Table, prior to our cruise, we tried to get a reservation online but couldn't get one for the time and day we wanted. We decided to wait until we boarded the ship and try to go to the restaurant on the first day of the ship and get a reservation. Sure enough, we showed up on the first day and got the day and time we wanted without a problem. Might be worth trying this idea out if you are in a similar situation. 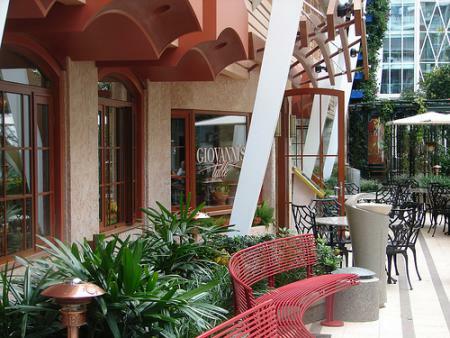 Giovanni's Table is situated in Central Park and features a very quaint and somewhat romantic setting. It kind of looks like that restaurant from Lady and the Tramp meets chic restaurant downtown. Inside the restaurant, you will find the place small enough to have some charm while big enough to handle a lot of hungry customers. There are tables that have a window to Central Park as well as seating outside to choose from. Further inside the restaurant are more tables that can accommodate larger groups. 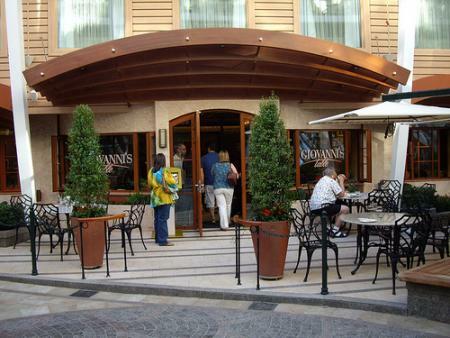 Giovanni's is meant to remind you of a restaurant in the Tuscany region of Italy along the coast. With it's northern Italy influences, Giovanni's Table certainly exudes the atmosphere one would expect from an Italian restaurant that serves traditional Italian dishes. Serving to help sell the idea of a real Italian restaurant is the fresh meat slicer that frequently is used by the wait staff to slice fresh prosciutto ham in razor-thin slices. The smell fills the room each time and it adds to the charm of the restaurant. For dinner, Giovanni's Table offers a fairly large selection of Italian food. There are three main courses, appetizers and salads, pastas and entrees. The appetizers, salads and pastas are all served family style, meaning large plates are brought out of each item with the understand that you will share the items between the members of your party. In most cases, there was enough food on each family style dish to easily satisfy two people and more than likely could be enough for 3-4 people. To start with, appetizers are the first course and there's a lot to choose from. For just me and my wife, we found three options that we both wanted to try before we even got to the soups. For our starters, we chose fresh mozzarella and tomato, caesar salad and focaccia alla Giovanni. The mozzarella and tomato was good, much like any other time we've had this dish before. The ingredients were fresh and we chose to add olive oil and vinegar to give the dish a little something extra. The caesar salad wasn't anything special and tasted perhaps a tad bit better than the caesar salad we had elsewhere on the ship and wasn't something I'd feel obligated to get again. The foccaccia alla Giovanni can best be described as cheese bread with a little potato between the cheese and the bread that comes with the option of dipping the bread in a pesto sauce along with other accompaniments such as green and black olives. This was surprisingly good and was the best choice we had among the appetizers. Next up is pasta and we decided to share one dish, the gnocchi, which are small potato filled pastas in a white sauce. Gnocchi isn't by any means a favorite pasta of mine, but it seemed like a decent choice. While the gnocchi was good, we both felt after a few each that the pasta "got old". As in, it was still good, but we couldn't eat a lot of it at once. More than likely going to pass on this for our next visit. By the time we got to our entrees, we were both feeling a little stuffed. To Giovanni's Table's credit, they give you a lot of food and you're best served to try bites of each even though we felt guilty leaving any of the food on the dish to be thrown out. For my entree, I opted for the tuna dish, which was kind of like an Italian version of ahi tuna. A lightly cooked tuna that is rare on the inside (warm on the inside, unlike ahi which can be cold). This was really good and was easily the best thing I ate that evening. The sauce was light, which is key because the fish should be the focal point of the taste, not an overbearing sauce and with the baked tomatoes and potatoes along side, it was enough to stimulate my appetite to want to eat it all. My wife opted for the filetto di Manzo alla griglia, a grilled 8oz beef filet tenderloin. It was a good cut of beef and definitely better than the steaks we had in the Main Dining Room. It also wasn't the best steak we've ever had but it certainly was something we could enjoy and I had a bite of it as well. We both thought it was good and were satisfied with the option. In terms of pricing, we found Giovanni's Table to be a good option at $15 for dinner per person and $10 for lunch. We opted to eat here on "lobster night" (neither of us eat lobster) so a night at Giovanni's Table may be best for a night where the menu doesn't look very good in the main dining room. The wide selection of food and mostly tasty options really left us happy that we stopped by. I think we both felt like it was worth the extra cost for a nice evening out and found the service better than the food. The Italian food is mostly traditional Italian food that many Americans love to enjoy. The food here wasn't as good as the Italian food we had previously tried at the specialty restaurant Palo on the Disney Wonder, but felt it was still a good meal overall. We did not try lunch, although we did notice that the lunch menu offers less options than the dinner menu. Giovanni's Table is open for lunch 11:30am to 3:30pm and open for dinner 6:00pm to 10:00pm. And I’d love to hear your thoughts if you’ve been here! What did you order? Any suggestions or favorite items? Let me know in the comments below!